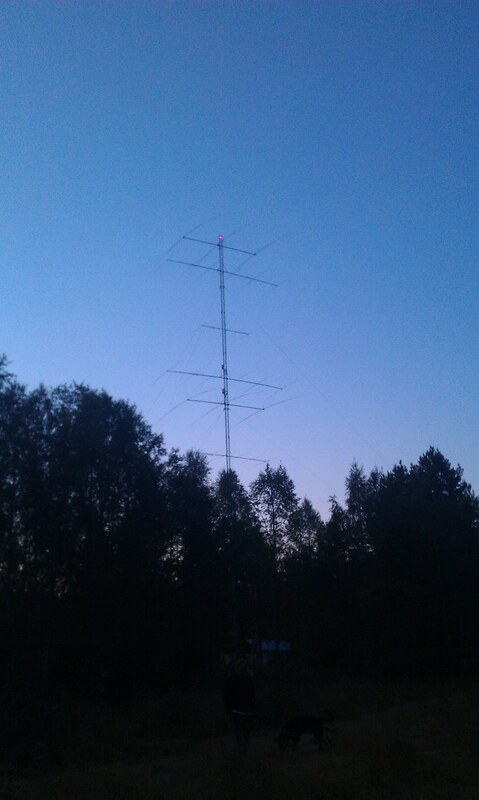 The main antenna system on 20m consist of a 6/6/6el monoband stack, at 55/39/23m height. This antenna system has got a phase box making it possible to change the vertical lobe angle in four different steps. Either 7, 13, 17 or 25 degrees. 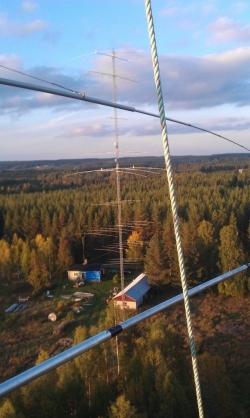 The three antennas are always fed together, but there is a possibility to put in a 180 degree coax on two of the antennas, making it possible to switch it in four combinations. The phasing system in theory, makes it so that we have a maximum of 3dB drop between 6 and 28 degrees compared to max gain. These antennas are homebrew after OH8QD design (18.5m booms! ), but with rebuilt feed point system from gamma to hairpin. 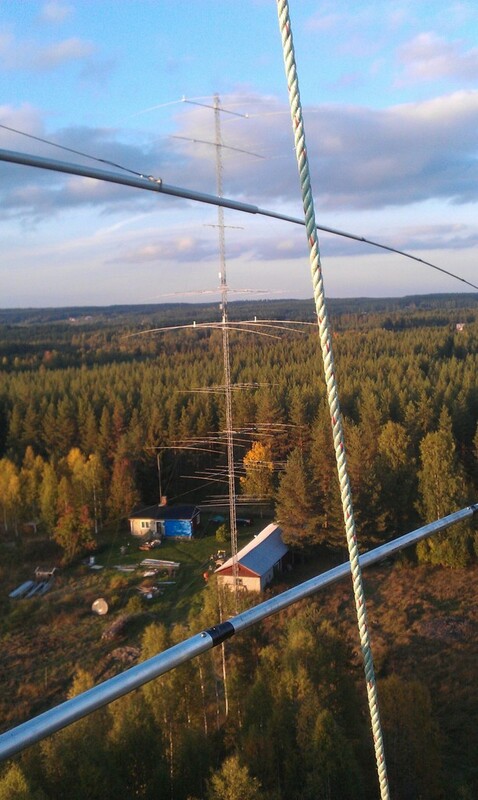 The second antenna system on 20m is a 5/5el monoband stack (SJ2W design) that is sitting in the military tower at 38/24m and is rotational. 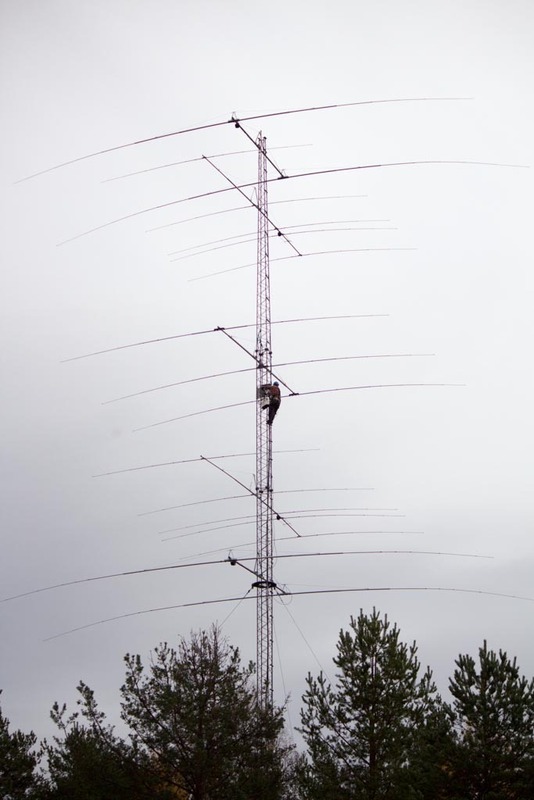 There is also a 4el monoband yagi redisigned CUE DEE sitting at 16m height fixed at Europe. For the 6/6/6el stack there is a 7/8″ cable running from the switch room up to the phase box which is about 37m up in the 60m tower. From the phase box there are 3 pcs of RG-213 running out to each antenna. All connectors here are 7/16″ DIN. The 5/5el stack is fed with CGT-400 between the antennas and stackboxes, then 7/8″ down to the tower base and 1 1/4″ from the tower to the switch room which is around 120m. For the 4el monoband yagi there is a 7/8″ coax from the switch room up to the antenna, and a RG-217 jumper cable attached to the hairpin match.